It is important to have windshield wipers that are in good condition for your vehicle. If you notice streaking or hazing on the windshield when it snows, there might be worn out wiper blades. There could also be an indication of noises coming from the wipers. This means they are not wiping away smoothly or efficiently. The wiper blades may also pull away from the windshield at higher speeds rather than fitting snugly against the windshield. The rubber portion of the windshield wiper blade should also be inspected. 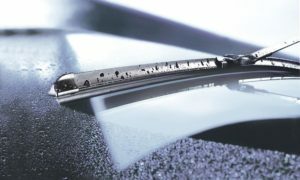 If the rubber edges look worn or torn, the wipers should be replaced as soon as possible. It is also recommended to inspect the metal arm of the wipers. If it is bent or cracked, new windshield wipers will be needed. One of the most neglected components on a vehicle is the wiper blades. Many blades are cracked, torn, split, or brittle. If the windshield wiper blades look like this, they should be replace as soon as possible. It is necessary to clear off any water, road debris, sleet, and snow from the windshield. Cold weather can affect the life of the windshield blades. Freezing temperatures can make the rubber portion of the blades hard and brittle. This can increase the likelihood that they will crack or split. The holders can also become clogged with ice and snow. This prevents the holder from distributing spring tension evenly over the blade. It can cause the blades to freeze up and leave streaks as it moves across the glass. Heavy usage of the windshield wiper blades can be hard on them as well. It can result in the blades wearing down and needing to be replaced. It is important to inspect the windshield wipers regularly. This can help to ensure they are in the best condition possible. Check the wipers for any wear or tear they might have. Also make sure there is not a build-up of debris, snow, or ice on them. Ice build-up can cause scratches to the windshield with time. This can result in a costly repair bill in the long run. Also make sure that the back windshield wiper is efficient if your vehicle is equipped with one. The windshield wiper fluid should also be topped off to the recommended amount indicated on the reservoir. The windshield wipers may need to be replaced if you notice a poor condition of the wiper arms and holders. This could allow sloppy wipers that will not effectively clear away the windshield. If you notice any issues with how the wipers are working, make sure to bring your vehicle in. We can inspect the windshield wipers to make sure they are in good condition and effective at cleaning the windshield of your vehicle.